I am a singer and I hope that you are too. As a child I learned piano and I performed in competitions which I found very nerve-wracking. As a way to release tension before playing to an audience I used to sing whilst strapped into the backseat of the car on my way to the aforementioned. Singing has always been a way to release and eventually became something I ‘shared’ rather than a way to move through another form. There are five favourite singing events in my life. The first I think still happens. 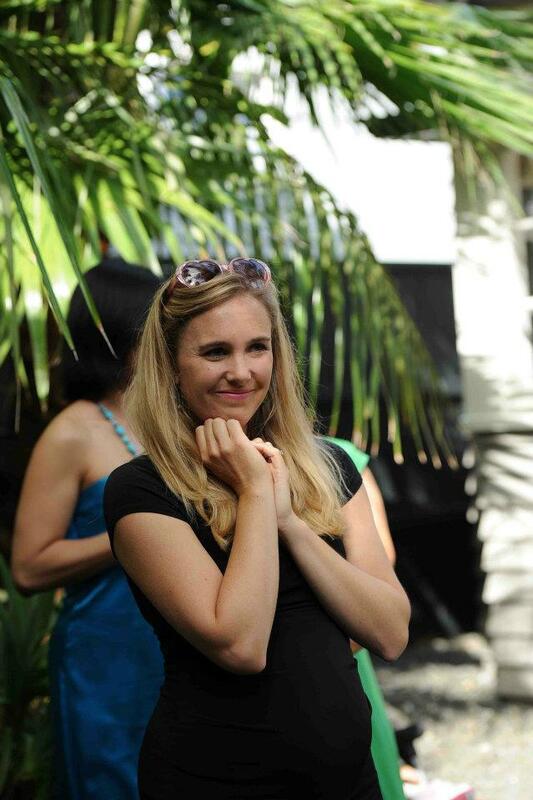 Barbie Seton, in her beautiful Papamoa beach-front property hosted Christmas Carols for some of her friends, which used to amass to about 50 or 60. Kate Madill having travelled down from Auckland and after a few glasses of red would take up her place in front of the line of black and white, and by ear/memory, festive tunes would tumble. The picture was always the same. After the BBQ, croquet on the lawn and running through the golden sand dunes, Mums and kids came to sit cross-legged on the carpet interspersed by a random Dad and child, and arc around the upright. My little sister Tessa would sit in that crown-shaped-space of Mum’s crossing legs, her back against Mum’s music and inflating and returning chest. The tall, rum and coke-ed men (this is the 80s before bottled wine in New Zealand – the age of Chablis packaged in the cardboard cask contained in the plastic bladder) would stand leaning against the fridge, the kitchen bench, the doorway, close to the comfort of the masculine BBQ, trying to behave themselves and temper their bass and baritone bantering. The favourite songs were the ‘Little Drummer Boy’ with its unsuspecting rhythm and the ‘Twelve Days of Christmas’ which would herald Barbie from the kitchen ‘supervising’ the menfolk to her position down front, dishing out the different sections of the room to their various part/line/verse. The song invariably came toward the end of the night when the men softened and resembled something closer to their little boy of self, and the song invariably lost a little tempo and perhaps a little pitch for the mens’ lines which were always the same – ‘5 gold rings’ and ’11 maids a milking’. The men seemed to make a mouth-full of that line, as if they were conjuring some Swiss lass from their travels kept in the 70s. The next memory was Laughton Pattrick’s gathering of Toi Whakaari/NZ Drama Schools’ staff and students. This man doesn’t entertain the notion of tone deaf. When playing scales/warm ups for specific people he adjusts the tonic to tune to the sound coming from the individual voice – what a gentleman. ‘O Fortuna’ was a gift with that man and that patchwork of a choir. The school stood together (which was a rare position) in his presence. Third on my list of life altering singing moments was experiencing my first ever ‘Fete de la Musique’ which deliciously features on my birthday, 21st of June, each year. What a celebration. I have been in France three times for this event, the first took Eryn and I completely by surprise. The lanes of stoned Bordeaux echoed with music from every era. Live Reggae smoked out an open window of some students’ aparto. A 15th century French bagpipe played a Sarabande elsewhere. And a picture that was pressed into my heart, as I once collected childhood violets to hide and scent between pages, was a long banquet of friends dining beneath their balcony, complete with photocopies of lyrics for traditional French songs. One would suggest une chanson, une page and away the sound flew, moving along the lane with the mojitos and saucisson, fresh from the abundant street stalls and party. The final reaching-to-the-core-of-me singing event is listening to our daughter sing ‘Twinkle, Twinkle’, with its altered lyric and its repetitive hypnotic circling. It becomes as unconscious and unstopping as breathing to her. But I write all this fairly indulgently to prelude two final momentous singing events I have experienced and would like to share with you. Singing is gold for the soul. It moves our breath. It gets things out, like vacuuming under the bed. It brings people together in a way nothing else can. The melodies, harmonies, rhythms deliver a kind of food to perhaps the organs and the edges of what our bodies are. The experience of making a tapestry of sound with others is medicinally immediate, energetic and vibrating. Everyone could try it. Whilst pregnant with Clara and accompanying Drama students in 2010 to the New Zealand Festival I experienced Janet Cardiff’s ‘The forty part motet’. I was moved to stillness. When I entered the room decorated in the sphere of speakers, each singing with their different voice, all I could manage was to sit, centered on one of the featured benches. The second time I stepped from one speaker to the next as if stone hopping in slow motion. If you search on youtube you’ll find someone’s renegade footage of the exhibition which will give you some sense of the magic. Each speaker holds a vocal part, one or sometimes three voices. So when one walks around the perimeter of the speakers one gets the sense of the individual, when one moves to the centre, one gets the whole. My pregnant being adored it. I even stole time to return for a third and final hit before boarding the plane northbound. “I placed the speakers around the room in an oval so that the listener would be able to really feel the sculptural construction of the piece by Tallis,” Artist Janet Cardiff. 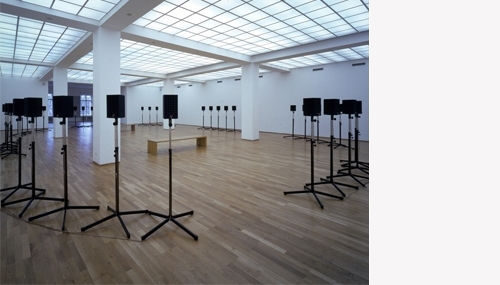 The Forty-Part Motet (2001) by Canadian artist Janet Cardiff is an immersive sculpturally-conceived sound piece, in which 40 separately recorded voices are played back through 40 speakers. This evocative installation uses recordings of the Salisbury Cathedral choir singing Spem in Alium Nunquam Habui (1573) by Thomas Tallis, one of England’s most influential Renaissance composers. Photo: Jens Ziehe, Courtesy the artists, Galerie Barbara Weiss, Berlin and Luhring Augustine, New York. This final clip of Eric Whitacre’s ‘Water Night’ sung by Virtual Choir 3 features a teaching colleague alto Jeni Little. I have vowed to join Virtual Choir 4. Whilst I prefer to be gathered voices in a space, to feel the resonance in bones, I champion this project for encouraging song, breath and uniting enthusiastic individuals. So what started out in my mind as a short sharing of two youtube clips has become some sort of tribute to the event of the song. Sing, folks. In the shower. With your children. In bed. When you’re sad. To or with your lover. When you’re elated. Be bold and move breath.